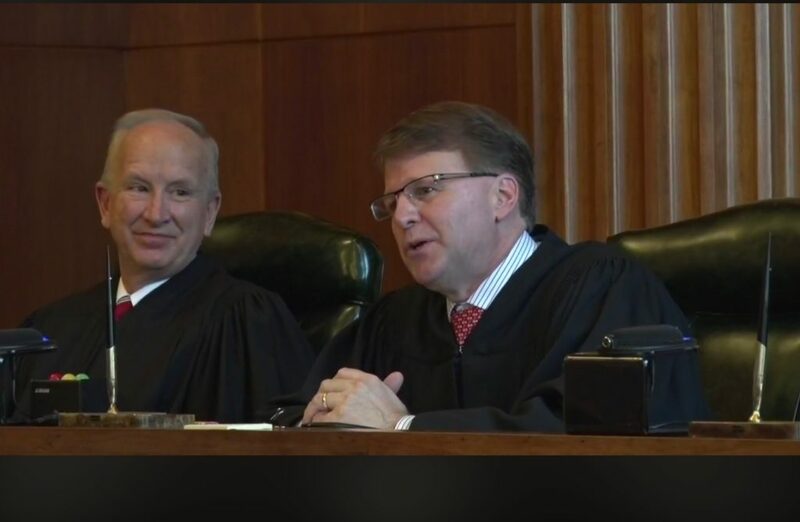 N.C. Supreme Court Chief Justice Mark Martin, right, delivers remarks during the Jan. 7, 2019, celebration of the court's 200th anniversary. Senior Associate Justice Paul Newby listens. If party labels tell the story, Chief Justice Mark Martin could end up on the losing end of a lot of N.C. Supreme Court decisions this year. Martin’s remarks during the recent celebration of the court’s 200th anniversary suggest he’s looking forward to a different outcome. In other words, judges should refrain from acting like legislators. “If judges do strive in good faith to observe the principles of Federalist 78, then the courts will in fact be the least dangerous branch,” the chief justice added. Martin aimed his words at a room full of federal and state judges, along with other lawyers and political leaders, including Democratic Gov. Roy Cooper and Republican Lt. Gov. Dan Forest, potential combatants in the 2020 race for the state Executive Mansion. But one suspects that the chief justice hoped colleagues sitting to his left and right would take special notice. Martin is now one of just two registered Republicans on the seven-member Supreme Court. His newest colleague, Democrat Anita Earls, donned the black robe this month after decades of displaying her “preferences and opinions” as a lawyer pursuing causes for left-of-center advocacy groups like the Southern Coalition for Social Justice. Democratic partisans have hoped and their Republican counterparts have feared that a new 5-2 Democratic majority on the high court will lead to a substantial shift in court rulings. They predict a shift toward the political left. That outcome is possible. It’s not guaranteed. With a 4-3 advantage during the past two years, Democratic justices rarely displayed any evidence of a desire to secure partisan outcomes. Democrats and Republicans split along party lines in just three of 155 rulings handed down in 2017 and 2018. (In a fourth instance, the seven justices agreed on the result of a case while splitting along party lines on the legal reasoning.) Only one of those cases, the Cooper v. Berger ruling on a disputed reworking of the state elections board, involved a political dispute. In September, the court rebuffed Cooper’s attempt to block two proposed constitutional amendments from appearing on the fall election ballot. Without comment and with no sign of dissent, justices followed the standard appellate process and ultimately endorsed the conclusions of a Superior Court panel. Follow that guidance, and avoid playing partisan political games, and the Supreme Court will give North Carolinians more reasons to celebrate its accomplishments in another 100 years.